Seeing the forest through the trees is so 2018. In the coming years, ecologists are planning to do a lot more listening through the trees in an effort to get a better handle on forest health. A new study released on Thursday in Science illustrates how deploying simple acoustic monitoring devices in tropical forests can provide new insights into biodiversity. With the falling costs of listening devices and storage, it could soon become feasible to set up a network that gathers a baseline soundscape scientists can use to monitor impact humans are having on the landscape. Until recently, scientists have had two main avenues to monitor forest health. The first and oldest is trekking into the jungle to take samples and measurements. But that slow, methodical approach only captures a very tiny sliver of what’s going on unless you’re visiting a lot of places and have long-term monitoring. More recently, satellites and aerial surveys have given scientists the ability to see the bigger picture. But with the exception of canopy-penetrating LIDAR, those techniques only give scientists a view of the trees. There’s still lots of interesting stuff that can be gleaned from those types of surveys like forest cover, tree health, and large-scale changes. But it doesn’t tell us anything about the animals on the ground or what humans may be doing in the understory. Bioacoustic monitoring aims to fill the gaps of these two methods. The premise is simple: You simply deploy a listening device and then go back and swap out the memory card when its full and voila, you have a wealth of sonic data across a surprisingly large sound theatre. Game and his co-authors have done recordings in Papua New Guinea as well as Indonesia. Early results show there’s a clear difference between disturbed and undisturbed forests with the latter having a much more dense soundscape. In Puerto Rico, other researchers found a similar phenomenon comparing the soundscape from before and after Hurricane Maria, an indication that there are plenty of other uses for bioacoustic monitoring. That’s why Game and company are advocating for more researchers to pick it up as a new tool of the trade in an effort to help conserve more lands and slow the loss of biodiversity in the face of logging, palm oil plantations, farming, climate change, and other threats that have afflicted tropical rainforests. Bioacoustic monitoring alone won’t provide a full snapshot of a forest health or if countries are meeting conservation goals—some species don’t vocalise (ahem, trees) and its still in its infancy so there’s no clear baseline—but Game said it could be a good compliment to satellite and other on-the-ground surveillance tools like camera traps. The time has never been more ripe to pursue sound monitoring. 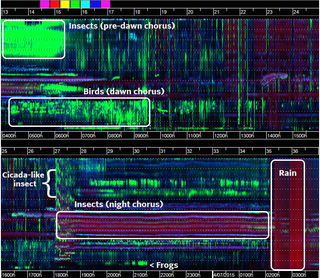 Game said that while scientists have made recordings in the past, they’ve been limited by cost or a narrow focus on one species. Now, a combination of factors have opened the floodgates for more widespread adoption of bioacoustic monitoring. Chief among them are smaller units with more memory that are cheaper than their predecessors. Game said units that were once more than £3,000 now run in the £500 range, allowing researchers to deploy more of them and sample the landscape as a whole as opposed to focusing on a specific area or species. The rise in computing power and machine learning has also opened up new ways to analyse the massive amounts of sound data. Beyond the scientific value of such work, bioacoustic monitoring gives the rest of us a chance to hear places we may never get the chance to visit. You don’t have to be an ecologist to hear what makes those places special.